Peruc is a small village about 40 km from Prague (the capital of the Czech republic). There is a small sized barroque church from 1763-1765. It is consacrated in honour of the apostles Peter and Paul. These pages portrait the instrument which may be seen on the left picture. The organ was built in 1766 by Johann Ignaz Schmidt (1727-1802), famous organbuilder of the Loket school. This opus is one of his earliest preserved instruments. It has two manuals with pedal, alltogether 12 speaking stops. Its tone is rather mild and sweet as it was usual for the instruments of this period and size. 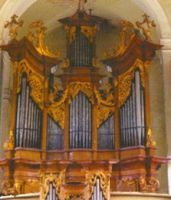 The organ belongs to the nicest in the region as far as the sound timbre is concerned - it is used occasionaly for commercial recordings. In the lowest octave the wooden pipes of Kryt 8 and some of Fletna 4 are heavily eaten by a woodworm. Restauration needed. The Principal 4 (Prospekt) pipes are invaded by a tin disease. In spite of that it has conserved its specific timbre. But it heavily needs a restoration. Its price is estimated around EUR 50 000. Sponsorship welcome. You can hardly find an organ with historical tuning preserved in our country. Nearly all (not to say all) the organs underwent HEAVY restorations/rebuilding especially during the first half of the 20th century when the "ideal sound" was perceived much differently than today. The Peruc organ is quite happy to remain mostly untouched. Nearly all the pipes are original Baroque. There are new stops Principal 8' and Violon 8' introduced by Rejna-Cerny firm during the only significant rebuilt in 1901. The original Kvinta 1 1/3' was removed. Its pipes were used as the lowest rank of the current Mixtura which was originally higher, starting at 1'. Hence, the original Baroque mixtura was lowered by one rank but its pipes are still Baroque. The Salicional 8' is also from 1766. The pipes in its lowest octave were replaced by new zinc pipes. This leads some researchers to a conclusion that the original Salicional was 4'. I think the solution is simpler. The largest metal pipes were confiscated for war purposes (1914-1918) and then replaced by zinc pipes. Fortunately enough, the Principal 4' in Prospekt remained untouched by requisitions. It is logical: its pipes are not large enough to provide enough material for weapons. The old console was replaced by a new one while preserving the original short octave. Pedal C1-A2, short octave. You will note very soon that I have derived the new Mixtura and the Kvinta 1 1/3 artificially from the preserved Octave 2 (!) so the new Mixtura is actually several partial stops sounding at once. It is an experiment to hear how the instrument sounded before 1901. Tomas Horak: Varhany a varhanari Lounska, Zatecka a Podboranska, Albis International, 2003, pp.92-93.